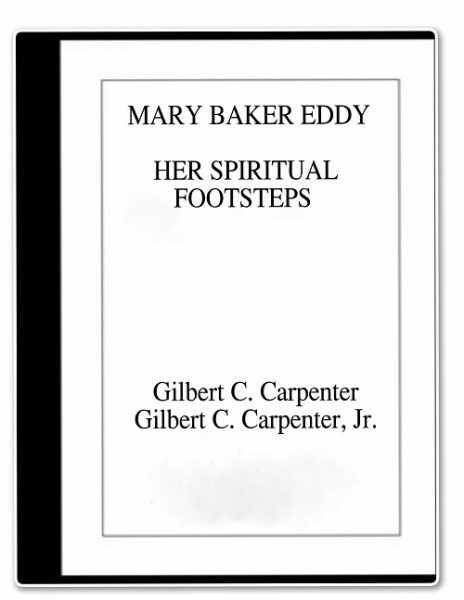 Spiritual Footsteps includes first-hand accounts of how Mrs. Eddy met and dealt with everyday challenges and demonstrated Christian Science, not only in the important work that she did for the Cause, but also in the details of her daily life. In 1906, Gilbert Carpenter, Sr., served Mrs. Eddy for a year at Pleasant View as associate secretary. After leaving there, he spent many years trying to understand why she did things that led students to accuse her of being difficult to please, illogical, unreasonable, even unkind towards those helping her. Eventually he felt he had come to understand the spiritual motives underlying what she said and did. As he learned to interpret them spiritually, he began to talk about them. His talks were recorded, and they became the basis for one of the finest memoirs about Mrs. Eddy that has come down to us. Because Mr. Carpenter was an outstanding practitioner, he understood her teachings on animal magnetism and malpractice, and this enabled him to reveal our Leader’s life in such a way as to give us a greater appreciation of Mrs. Eddy and her own daily demonstration of Christian Science. This is one of the best memoirs of her that has been written because it explains why she placed so much emphasis on living according to spiritual standards, and why she demanded these standards from all the workers in her home. This book is much more than a personal account of Mr. Carpenter’s association with Mrs. Eddy. Each of the one hundred and twenty-seven chapters is based on sound metaphysics and serves as a lesson in Christian Science.